Cinnamon Crumb Cake: moist sour cream cake ribboned with brown sugar & cinnamon, and topped with a thick layer of crumbly streusel. A total classic, so delicious with a cup of coffee! I have certainly made my love for all things crumb-topped well known here at Baking a Moment! But recently I realized there was a glaring omission in my recipe index. No no no no no. This cannot be. So I immediately got to work baking up this total classic. The cake itself is moist as can be. Of course it is, it’s made with sour cream! But really it’s all about the crumb topping. It’s got plenty of spicy cinnamon and warm brown sugar, and there are two layers of it! One running all throughout the middle of the cake, and another thick, crumbly layer on top. 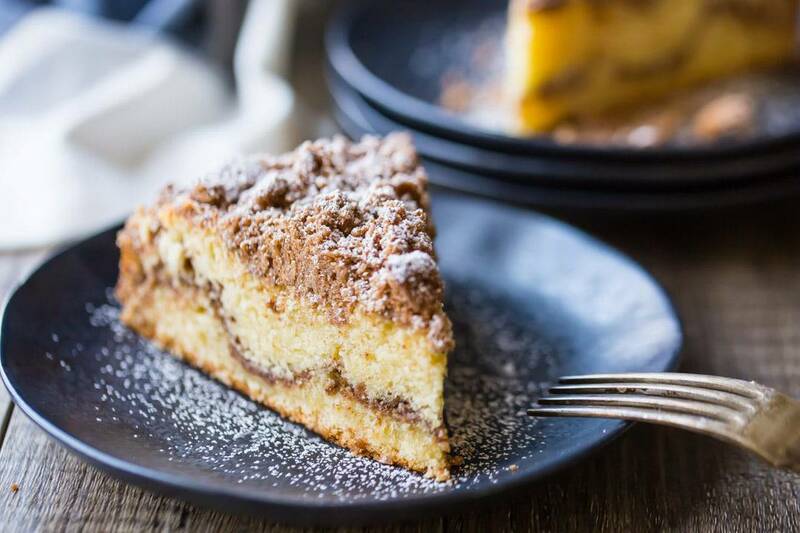 Just wait until you sink your fork into this coffee cake! All those layers together- you’re in for a real treat! Get your mug of coffee ready! More great brunch recipes on my “Breakfast/Brunch Recipes” Pinterest board! Place the butter in a small pot and melt over low heat. Add the flour, brown sugar, cinnamon, and salt, and toss to combine. Preheat the oven to 350 degrees F, and mist a 9-inch springform pan with non-stick spray. Place the flour, sugar, baking powder, baking soda, and salt in the bowl of an electric mixer, and stir to combine. Add the butter, and mix on medium-low speed until the mixture resembles damp sand (about 2 minutes). Add the eggs, one at a time, mixing on low speed until smooth. Scrape the bottom and sides of the bowl with a silicone spatula, then add the sour cream, vanilla, and lemon juice. Beat on medium speed for about 1 1/2 minutes, to aerate the cake batter and build its structure. Transfer half the cake batter to the prepared pan. Top with half the topping, then spread the remaining batter on top (layers of cake batter may seem thin, but they will puff up as they bake). 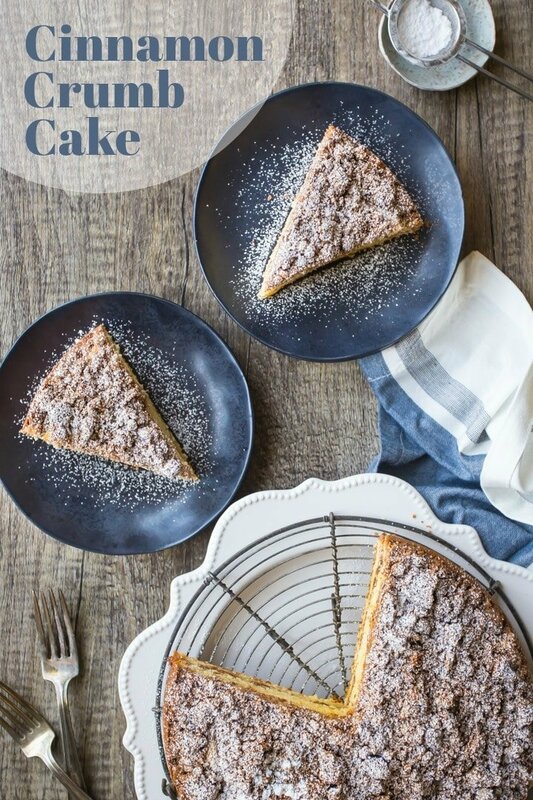 Sprinkle the remaining cinnamon crumb mixture on top, then bake the cake for 30 to 40 minutes, or until a toothpick inserted in the thickest part of the cake comes out clean or with a few moist crumbs. Cool completely, then dust with powdered sugar for garnish. 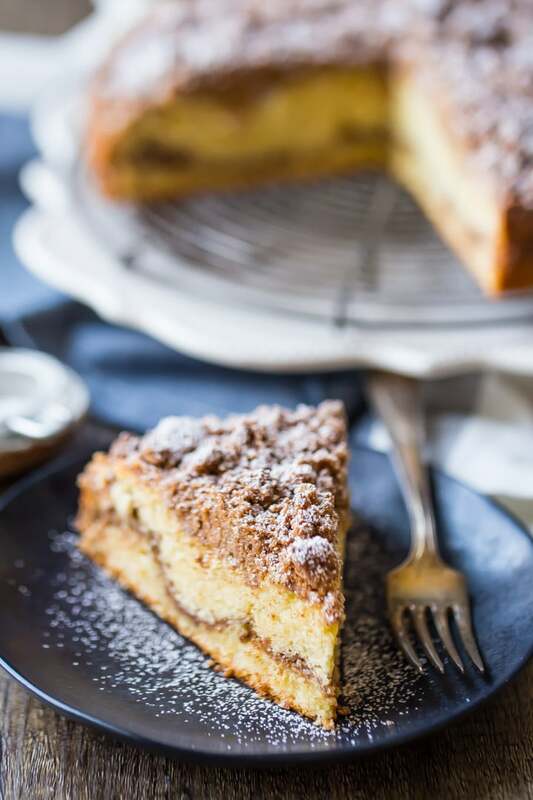 Cinnamon crumb cake will keep for 3 days at room temperature, up to 2 weeks refrigerated, or 2 months in the freezer. Be sure to wrap tightly in plastic wrap to prevent staleness. Looks so moist and delicious! Perfect addition to a weekend brunch! 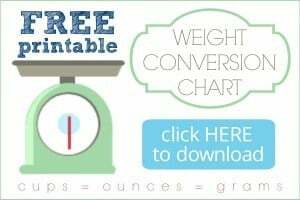 This is perfect for a weekend brunch! 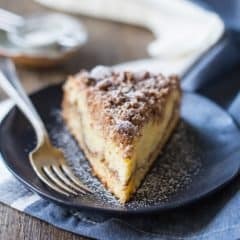 That cinnamon crumb topping looks amazing! I could eat this morning, noon and night! The crumb topping looks AMAZING! I adore cakes like this! This might be my son’s favorite thing – he loves cinnamon treats! This is going on my must-make list for sure! I just awoke from a dream where my wife was crossing the room toward me carrying a piece of this cake with nothing but an apron on. Wow, who cares about crumbs!